I set out on a very round about alternate route home today. Events and scheduling of the day had lined up perfectly for such an alternate trip. My normal trip home from Redmond, Washington is to board the #545 at Overlake Transit Center bound west for Seattle proper, once there I just walk about towards home, sometimes from the downtown core or sometimes down Denny or through South Lake Union. Today I’m heading south from Overlake Transit Center on the #566 headed for Auburn, Washington. The bus takes a trip south down through Bellevue, then on down I-405 toward Kent. From either Kent, or a stop before then, I intend to transfer and hopefully catch a north bound Sounder Train. Since this is a rather spontaneous effort, I could be stranded at any random location. However, I’ve no fear, so “meh” I say. I ended up realizing I wasn’t going to make the Sounder, so decided to get off at the Renton Transit Center in downtown Renton. It seemed I had good timing as I got off the bus and walked right into the Renton Farmer’s Market! Kettle corn was smelling great, freshly cooked up, and all sorts of tents offering various things. I love these bits of community, absolutely great! I however skipped out on the farmers market and went into a local establishment called Best Burger. It was located directly across the street from the transit center. Further along 3rd the Italian Joint almost caught me, but I wanted something along the junk food line of American Burger. Afterwards I scoped out a return trip to Seattle proper. I ended up with deciding on the Metro #106 Route. It has a winding route from Renton, by Rainer Beach a ways, and up and over Beacon Hill. Unfortunately it doesn’t pass by the actual Beach, I’m still curious to see the area. The bus wound up over steep hills, twisting and turning through the streets. We left Renton without much to notice we did and onward toward Rainier Beach Area. The skyline was beautiful, with trees reaching up broke the spears of sunlight. Each ray of light flashing as the trees gave relief to those sitting by the windows of the bus. However several people still shielded their eyes from the brightness. Once the bus made it to the top of the hill, one could look back and see off into the distance as we turned. The bus stops seemed like they were every block or two now. If you’ve checked out the link for the #106 route, you’ll see that there are a great number of stops along this route. This is one of the reasons that I chose it, as I knew the run would be a bit slower, making it easier to take in the view of the route. Moving along the spine of the hills we entered Skyway. Once on this rode I knew I had picked a gem of a route. This part of town was pretty sketchy. Businesses along the way were open, but just as many were shuddered. Some of the single level buildings, and some two story buildings weren’t shuddered, but could easily have been mistaken for being so. We rolled further along the route through residential and commercial districts. Along the decline of Skyway I looked out and could see the southern stretches of Lake Washington. Highway 90 was in the distance, with cars the size of ants zipping across. The water looked smooth glimmering in the sunlight. The tree lined shores of the island broke the water with vertical ease. With the sun and blue skies this was a rare sight for this area I’m sure! A little further along the route intersected with the Link Light Rail at the Rainier Beach Stop. From this intersection the route zigzagged back uphill. Some of the views down on Lake Washington are awesome from up here on this route. At this point, I’m glad I decided on this one! After a bit further a plane came SCREAMING overhead! I bound across the bus to see where it was in bound for. Sure enough we were by the Boeing Airfield south of downtown Seattle. We pulled up at the first stop in Georgetown and I saw a cool music shop and next to it a coffee shop. 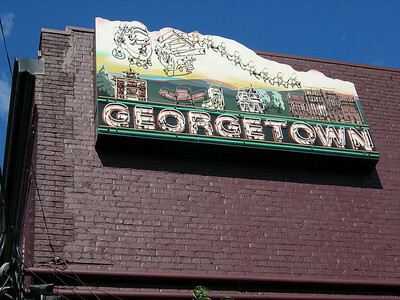 I then commenced to walk along the street in Georgetown and be wowed and the coolness of the area. Absolutely loud, being sandwiched between an air field, the Interstate, multiple rail lines, and other industrial nitty gritty, but awesome atmosphere for rock n’ roll, biker bars, and the like. Very rock star is what I’m saying. I walked around for about 45 minutes and then headed onwards toward downtown. That was my commute home for today, slightly different than the norm. :) Cheers! Next Post → Metro (and Sound Transit) Rock Star Drivers!